Big health insurance companies are predicting huge premium increases next year for small employers and people who buy coverage on their own, citing rising health care costs and new mandates from President Barack Obama's health care reform law. The Wall Street Journal reports companies including UnitedHealth Group, Aetna and Blue Cross & Blue Shield of North Carolina say health insurance premiums could rise from 25 percent to 116 percent for some people. Part of these cost increases are due to Obamacare's requirements that health insurance companies provide better benefits including maternity care and prescription drugs, accept any customer regardless of pre-existing conditions, and not charge older people more than three times what younger people pay. But the picture is more complicated than that. The health care reform law also will provide tax credits to small companies providing health benefits to their workers and to individuals who earn between the federal poverty level, which is $11,490 this year for a single person, and four times that amount. The Obama administration contends these subsidies will actually lower the monthly health insurance costs for many people compared to what they'd pay today for insurance that doesn't offer the same guaranteed benefits. The administration also expects intensified competition among health insurance companies seeking to enroll people under Obamacare also will squeeze premiums down. 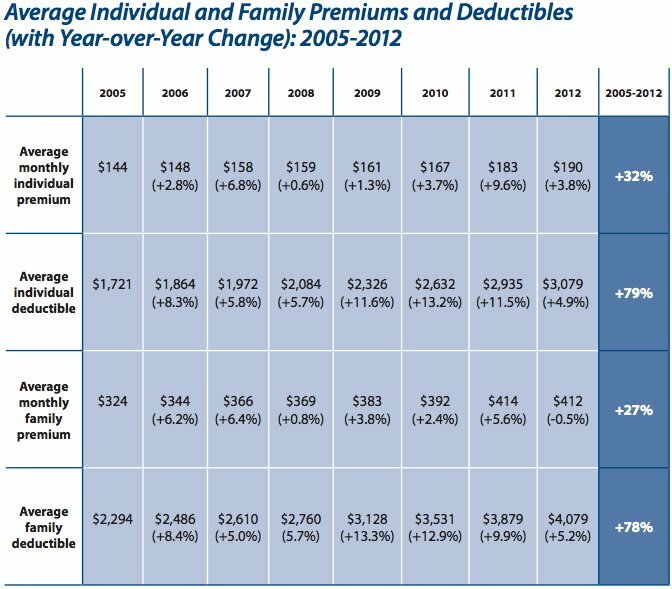 Moreover, health care costs continue to escalate, though more slowly in recent years, which drives up the price of health insurance. The health care reform law contains a plethora of provisions aiming to curb rising health care costs, such as tying Medicare payments for hospitals to improvements in efficiency and quality of care, but their effectiveness remains an open question as the Obama administration continues to implement the three-year-old law. Younger, healthier people are most likely to see higher premiums because of the benefit mandates and other provisions under the health care reform law while older, sicker people will gain guaranteed access to comprehensive coverage they may not be able to obtain on today's market. Since younger people tend to have lower incomes, they're also most likely to qualify for tax credits that would reduce what they pay for health insurance. The Congressional Budget Office projects that health insurance premiums will increase by an average of 10 percent to 13 percent as a result of the health care law, not including the effect of the subsidies. According to this 2009 estimate, 57 percent of consumers will receive tax credits that will cover about two-thirds of their premiums. Under the health care reform law, customers can choose four levels of benefits, dubbed "bronze," "silver," "gold" and "platinum." The law establishes a 2 percent to 9.5 percent cap on premiums as a share of a person's income, based on the cost of a silver plan. People younger than 30 years old also can choose a bare-bones plan expected to have the lowest premium although they can't use tax credits to pay for it. Health insurance premium increases for individuals and small employers aren't a new phenomenon. Between 2005 and 2012, the average monthly premium paid by an individual buying coverage on their own rose 32 percent to $190, according to eHealth, the operator of the online health plan vendor eHealthInsurance. Those premiums reflect many health insurance products that don't include benefits that will be required under Obamacare and current laws that allow health insurance companies to exclude people with pre-existing conditions and to charge higher prices to sick people, older people and women, which won't be permitted under the new rules that take effect next year. The predicted premium increases also represent only the individual and small-group segments of the health insurance market, not the expected prices for people who get health benefits from larger employers. According to data from the Henry J. Kaiser Family Foundation cited by the Wall Street Journal, about 15 million people currently purchase their own health insurance compared to about 150 million people who are covered by job-based health plans. Health insurance companies will be submitting proposals over the coming months for the plans they intend to sell, and the premiums they want to charge for small companies and individuals who will seek coverage on Obamacare's health insurance exchanges, the marketplaces that enable people to comparison shop and to learn whether they qualify for financial assistance, the Wall Street Journal reports. The exchanges are slated to open for business on Oct. 1 to small businesses and individuals. Plans would become effective in 2014.